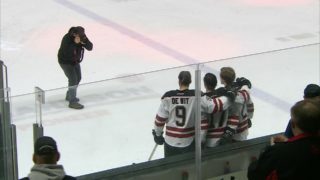 LETHBRIDGE — The Red Deer Rebels couldn’t maintain the positive consistency they showed through the first 25 to 30 minutes of Saturday’s WHL playoff game and their season ended as a result. 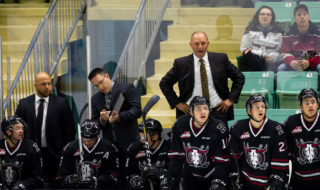 “We weren’t good enough the last half of the game,” said Rebels GM/head coach Brent Sutter, following a 6-4 loss to the Lethbridge Hurricanes, who took the best-of-seven Eastern Conference quarter-final in five games. Trailing 3-2 after 40 minutes, the ‘Canes pulled even at 3:17 of the third when Calen Addison bolted down the right side, cut across the crease and slipped a backhand past Rebels netminder Ethan Anders. Lethbridge forward Taylor Ross scored a go-ahead marker on a similar play just over a minute later, then Reese Johnson replied for the Rebels at 6:24, burying a backhand from the edge of the crease after taking a feed from Brandon Hagel. That was the final Red Deer goal of the season, as it turned out. Ross extended his stick to poke a loose puck under Anders exactly one minute later and Brad Morrison potted his second of the night, into an empty net, with 1:18 remaining. Red Deer suffered a major loss in the second period when Kristian Reichel left the game with a suspected concussion and separated shoulder following a reckless and dangerous hit by Zane Franklin. Franklin was assessed an interference major and game misconduct, but considering the obvious difference in talent, losing Reichel was a much bigger blow for the visitors. “We lost one of our best two forwards in the series, him and Hages (Hagel),” said Sutter. “It changed everything with our lines and we just don’t have enough depth and experience up front with our young kids. Reichel had just rang a shot off the crossbar when he was run by Franklin. Morrison opened the scoring 7:08 into the contest, taking a drop pass from Tate Olson and beating Anders from the left circle. The play started when Olson intercepted a pass in the neutral zone. 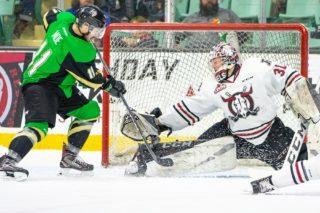 Rebels captain Grayson Pawlenchuk got that one back just over two minutes later, using a ‘Canes rearguard as a screen and zipping a low shot past Lethbridge stopper Logan Flodell. Hagel notched a power play goal from the low slot to give Red Deer a 2-1 lead at the 14-minute mark, but ‘Canes captain Jordy Bellerive answered back with a man advantage tally at 16:08, beating Anders to the short side. 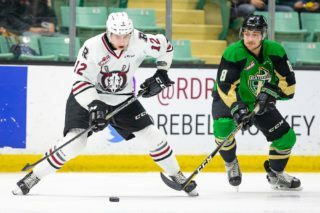 Defenceman Alex Alexeyev notched his second goal of the series in the second stanza — connecting with a wrist shot from the point to Flodell’s stick side — and the Rebels headed to the intermission with a 3-2 lead despite being outshot 18-2 in the period. Anders faced another 18 shots in the final frame and finished with 44 saves. He was sensational through much of the game but in the end couldn’t compensate for his club’s defensive lapses. After the Hurricanes won the first two games of the series on home ice by a combined count of 14-3, the clubs split a pair of hard-fought contests in Red Deer before heading back to Lethbridge. “It was there for us, but they won four games and we only won one, so obviously they were the better team,” said Sutter. Sutter will conduct exit meetings with his players on Monday. Notable: Flodell made 20 saves as the winning netminder . 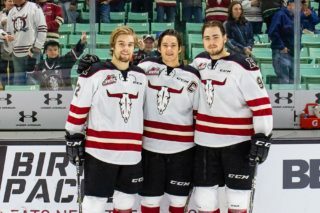 . . Those in charge of selecting the game’s three stars picked three Rebels — Pawlenchuk and Mason McCarty, both of whom played their final WHL game, and Hagel, who is eligible to return next season as a 20-year-old . . . Attendance at the Enmax Centre was 4,152 . . . Red Deer was two-for-five on the power play; Lethbridge was one-for-four.